You may have noticed it has been little a little quieter around here. I may do a few posts, then you don’t hear from me for a couple of weeks. It is not that I don’t have recipes to share and things to babble about, its just that the words just won’t come out. You see, I have been dealing with chronic migraines for almost a year now. They have been getting progressively worse, and one of the most interesting symptoms is a loss of cognitive function in the communication area of my brain. I have trouble finding the right words, saying the right words, and of course, writing. I was in the Apple store the other day, talking to a tech about my computer and whether it still had Apple Care coverage. I kept calling it apple core. I could not for the life of me say apple care! It was hilarious. . . embarrassing, but hilarious! Here’s another gem for you; My daughter and I were visiting a neighbor and she had brought a cucumber to snack on. While eating her cucumber, we were talking. My daughter wanted to add to the conversation, but had a mouth full of cucumber. Doing the mommy thing, I said ” Ruby, don’t eat while you’re eating!” She looked at me like I had just grown two heads. There was nothing to do but laugh, as my neighbor explained what I had actually meant to say. So I’m working on finding the right balance in my life to stop this very aggravating condition. Medication, diet, exercise, stress reduction, etcetera, etcetera, etcetera. 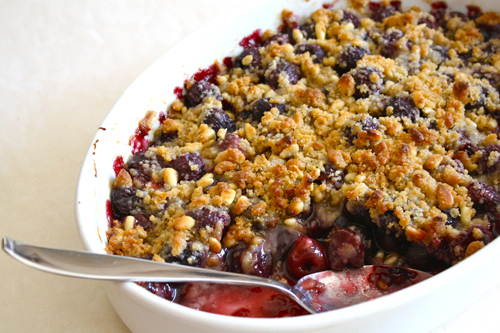 I developed the recipe for this cherry crisp a while ago, and it has been languishing in the dark recesses of my computer, waiting to be set free. Place pitted cherries into a large bowl. Add the vanilla sugar and cornstarch, stir to mix well. 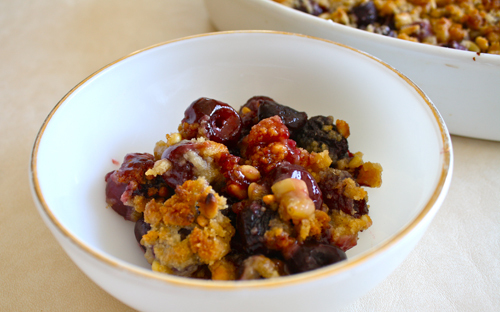 Pour the cherry mixture into a large baking dish. In a large bowl stir together the flour, brown sugar, vanilla sugar and salt. Using your clean fingers, pinch the butter into the flour mixture until it resembles crumbs. Mix in the pine nuts. Spread the topping evenly over the cherries. 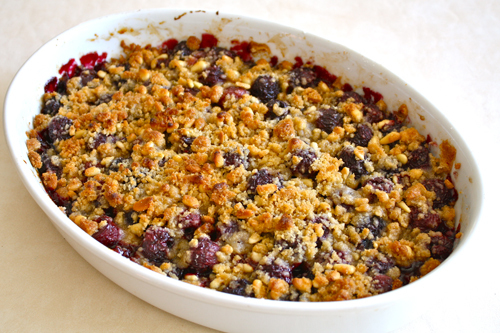 Bake for 40 minutes, until topping is lightly browned and fruit is bubbling. *vanilla sugar is made by placing a fresh vanilla bean into a container of sugar. Plain sugar can be substituted. Thank you! As long as I can keep laughing, everything will be OK! The recipe caught my attention, but your story pulled me in. Heartfelt wishes on finding the right balance for your life, and yes! keep laughing. laughter is the best medicine for the soul… thoughts and prayers are with you friend.